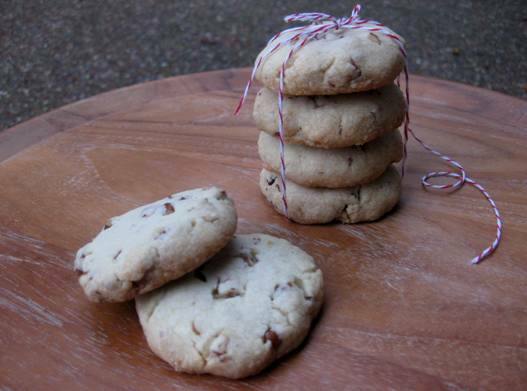 We were all so excited to get started baking, and the first recipe in the book is such a good one: Pecan Sandies! In the book, Thomas Keller tells a lovely story about his mother, his childhood, and what this particular cookie means to him. This recipe was a great way to start the project; easy, delicious, and fun to make. We had four contributing bakers this time, with varying results. 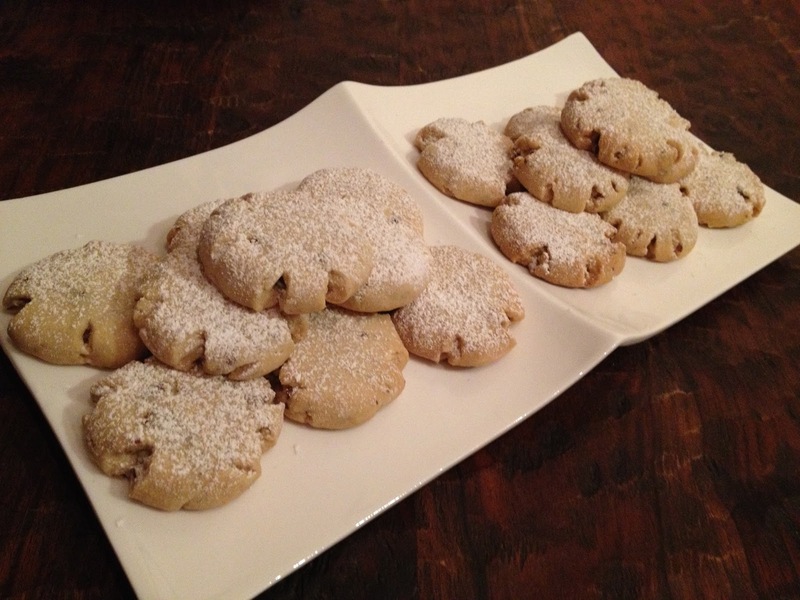 Overall, everyone enjoyed making this recipe and the cookies turned out great. I followed the directions, step by step as the book suggested, including making sure the butter was at room temperature and pre heating the oven for 45 minutes before baking. I love Thomas' story behind these cookies, I too have a connection to these cookies and felt a wave of nostalgia as I was eating them last night. My school nurse always had a box of Pecan Sandies in her desk drawer, she said they cured everything and made awful days better. She defiantly made days better but I don't know that her purchased cookies did. 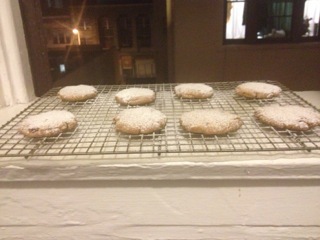 What I do know now is that these very simple cookies that I baked would make most days better! Great simple recipe that can easily be tweaked to your liking especially for the holidays. Pistachios or maybe dried cranberries. The actual cookie dough has a really nice crisp texture and is not too sweet. When working with the dough though, it was a little difficult. The consistency was like coarse crumbs, or what you'd want for pie dough. I couldn't really roll into balls so I just clumped the dough together to make 2" discs. Baked up really nicely. I used Strauss European-style butter. Made a big difference in taste. Super easy recipe, very delicious results. I dusted half with powdered sugar and left half plain. I yielded 24 cookies, more than the recipe indicated. This was probably because I didn't weigh each one before baking, I just used a tablespoon to measure. This recipe will be one of my go-to's, when I need an easy delicious treat. 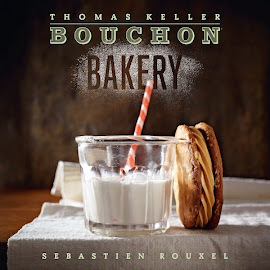 I received the Bouchon Bakery book for a Christmas gift when it was first published. After reading the mom and son history of the Pecan Sandie, I baked them with a full heart. The store version had gotten me through college and pregnancy. My first batch was very good. My second and third and fourth batches were deletable! Toasted pecans. Is there anything better than that first bite of the warm cookie with toasted pecans? I moved on and made the oatmeal cookie with chocolate chips (no raisins) because my husband does not like raisins. It was an excellent cookie--crisp on the outside and chewy on the inside. I made bite-size cookies so accommodate a more filling treat. I grew up with oatmeal cookies and am always trying the ones offered at coffee shops--just to compare. And well it is oatmeal, I like to pretend that it is a healthy treat. Growing up in the REAL dairy state- Wisconsin, homemade cream puffs have been a Christmas dessert since I could stand on a stool and watch my mom make them. So although I did try the pate a choux recipe and well shaped, dry on the outside, eggy tasting shells baked up...it was missing the memories. And then I moved to the piece de resistance - the Brioche Pecan Sticky roll. I am making the rolls for the 4th time. While the dough is in the frig over night, I found the Book Project. I enjoyed "Julie and Julia". I will see if they are picture worthy.